One of the biggest hawker trends this year is to increase the price of hawker food. JKJK. I wasn’t sure that selling $30 a bowl of lobster noodles would take off at hawker centres but apparently people are willing to pay for it and there is a queue. We tried the stalls, and we thought we would probably order the cheaper prawn noodles next time. Lobster Time at Bishan is newly opened on 10 Apr. 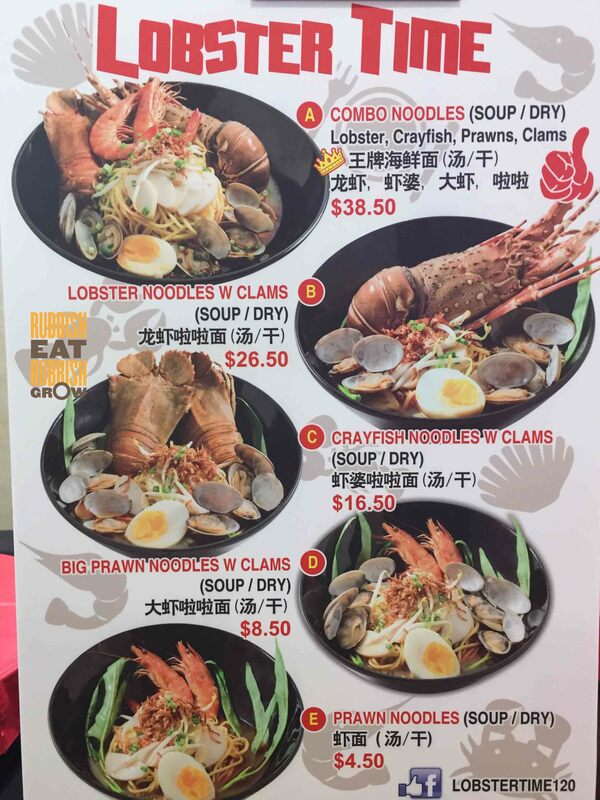 They sell 5 bowls: prawn noodles ($4.50), big prawn noodles with clams ($8.50); crayfish with clams ($16.50), lobster with clams ($26.50); and combo ($38.50). We ordered the crayfish and lobster. They use the same prawn stock across the 5 bowls, so it doesn’t matter which bowl you order. The soup is not good; it is thin, not sweet, and slightly spicy. Because the soup isn’t tasty, the vermicelli remains bland and doesn’t absorb the soup. Comparing the ingredients to Sumo Prawn Noodle, the ingredients here are fewer. There are only a few clams and no prawns. The crayfish and lobster are bland. One good thing is that the lobster and crayfish have roe on their feet, but it is hard to eat and strangely, it is bland. We thought that since the food is expensive and since they are in a small coffeeshop and not a big hawker centre, they could have delivered the food or at least have a beeping device for us to collect the food, instead of us standing around waiting for the food. When we were done with the meal, Mr Fitness said, “Heartpain to spend so much money on this shop. I miss Sumo.” Don’t think we will return. We paid $43 for two persons. There was a queue of about 8 people, but it moved quickly and we got our food in 15 minutes. The prawn noodles are at $4 a bowl; big prawns $7; crayfish $15; and lobster $29.90/$33.90. We ordered the big prawns and lobster. The soup is very shiok. There is a superb Chinese wine aroma, a sweetness that mellows into a seafood flavor. Although they use the same prawn stock for all bowls, the lobster bowl seems thicker but has a fishy taste. Luckily, they add a huge amount of garlic in the soup, which is fantastic. They give a generous amount of ingredients. And I especially love sucking the juice from the clams. The lobster is sweet but fishy and could be fresher. And what happens to its pincers?! Some of the prawns aren’t fresh, and at this price, I expect them to deshell and devein the prawns. But the shells are still on, and there is “dirt” in the prawns, which can be revolting. The vermicelli absorbs the soup, which makes it very tasty. We paid $36.90 f0r two persons. Although it is very shiok and umami, we decided that the next time we go back, we will definitely NOT order the lobster again. It is way too expensive. Since the soup is the same across the bowls, we will probably just for the cheapest item on their menu, prawn noodles ($4), or at the most, the crayfish ($15). We did not visit Fresh Generation Seafood Soup–because very far away–but for the sake of completion, we included it on this list. The difference between Fresh Generation and other stalls is that their soup is seafood base, whereas other stalls are prawn base. Their seafood soup goes for $6 but their signatures are crayfish seafood soup ($10) which has clams, prawns, sliced fish, lobster ball and crayfish; and lobster seafood soup ($28) which has prawns, clams, lobster ball, and lobster. They fry their ingredients first before making them into soup, thereby bringing out the fragrance. With the soup, there is a choice of rice or handmade noodles.